As people age, they may be more likely to develop chronic illnesses and pain. While many medical conditions can be managed by prescription medications, they are not without side effects. 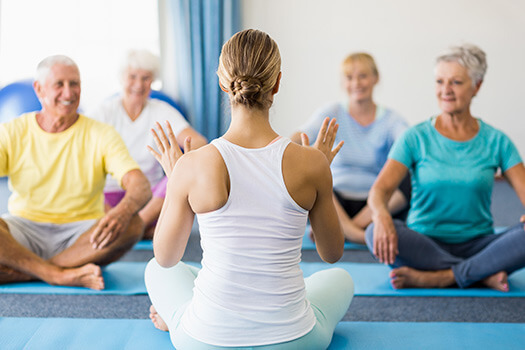 It is therefore important to try and implement complementary or alternative therapies such as yoga into an older person’s therapeutic care plan. Here are four ways yoga makes seniors healthier. Chronic respiratory disease, issues with posture, and degenerative spine disorders can lead to poor lung function and difficulty breathing. Participating in a regular yoga program can enhance breathing function by increasing oxygen flow in the respiratory system. Since yoga is a low-impact exercise, it is better tolerated by people affected by chronic obstructive pulmonary disease, asthma, chronic bronchitis, or fluid in the lungs. The deep breathing involved with yoga can help seniors keep several health conditions at bay. Living with a serious health condition can make it challenging for seniors to age in place. However, they can maintain a higher quality of life with the help of professional live-in care. Oshkosh seniors can benefit from assistance with meal prep, bathing, transportation to the doctor’s office, medication reminders, and much more. Osteoarthritis, rheumatoid arthritis, osteoporosis, and certain autoimmune disorders can lead to stiff, painful joints and muscles, which can make it difficult to complete activities of daily living. Yoga, like other low-impact exercises, promotes flexibility while lowering the risk for injury. Seniors who regularly practice yoga feel stronger and less likely to experience instability and an unsteady gait when ambulating. Those participating in yoga programs may notice they need less pain medication to manage their chronic conditions, and in some cases, they can stop taking their medications altogether. Seniors are more likely to exercise if they have a trusted caregiver to motivate them. An Oshkosh caregiver can help your elderly loved one manage his or her health in a variety of ways. If your loved one needs encouragement to exercise more often, eat healthier foods, or socialize on a regular basis, an in-home caregiver can address these and many other health-related concerns. Seniors can greatly benefit from the anti-anxiety effects of yoga. In certain people, yoga may be even more effective than anti-anxiety medications. Seniors are more likely to experience adverse reactions and side effects from psychotropic medications. Certain side effects can have serious health consequences such as an irregular heartbeat, diminished renal function, dizziness, and electrolyte imbalances. In addition to anxiety, many seniors experience depression. Advancing age, chronic illnesses, constant pain, and loneliness can trigger feelings of despair and sadness. Mild forms of exercise such as yoga promote the release of certain “feel-good” chemicals in the brain, known as endorphins. When endorphins are released into the bloodstream, anxious or depressed seniors enjoy feelings of calmness and wellbeing. Yoga can also dampen adrenaline surges, which raise the risk for panic and anxiety attacks and contribute to systemic inflammation. Yoga can also help seniors maintain healthy blood pressure. Hypertension becomes more common as people get older, and it is one of the primary causes of cardiovascular disease, stroke, and chronic renal disease. Yoga reduces the effects of oxidative stress and free radicals, and it is also a potent stress-reliever. Chronic stress has been shown to be a contributing factor in the development of high blood pressure. In combination with prescribed medications, nutritional interventions, and weight loss, yoga can be an important component of your loved one’s plan to stave off hypertension. If your loved one needs help and supervision to perform yoga but you are not available to assist him or her, consider hiring a professional caregiver. Oshkosh elderly care experts are available to provide high-quality care to seniors on an as-needed basis. From assistance with mobility and exercise to providing transportation to the doctor’s office and social events, there are a variety of ways professional caregivers can help your aging loved one continue to live independently. Call Home Care Assistance at (920) 710-2273, speak with one of our professional Care Managers, and create a high-quality care plan for your elderly loved one.